The fairways of Royal Pines will turn from green into a sea of yellow as players and fans alike celebrate the life of Jarrod Lyle this morning on day one of the Australian PGA Championship. 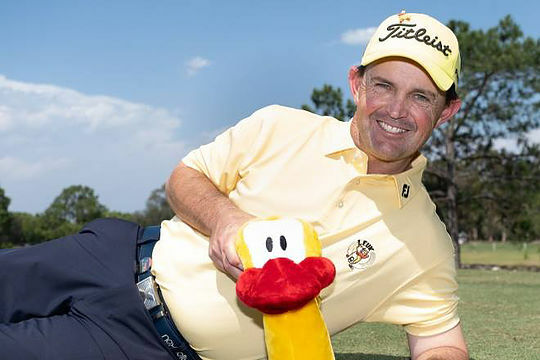 Golf’s biggest names will share their favourite stories of one of our biggest characters both off and on the course and will wear with pride the Leuk the Duck merchandise, which became synonymous with the big Victorian during his many battles with leukaemia. “It has a personal feel and that’s rare with charities,” ,” said Chalmers, the 2011 and 2014 Australian PGA champion. Titleist players will wear yellow hats and shirts for today’s opening round of the Australian PGA Championship, which will also be available for sale to the general public via the Challenge website. Leuk the Duck merchandise will be available for sale at Royal Pines throughout the tournament week. “Titleist have gone to another level in helping to raise funds because Jarrod was a Titleist player and then every one of the players will be wearing yellow tomorrow. We want the fans to come out on Thursday and wear yellow as well,” said Chalmers. “One of my favourite things to say about him was that he was a better human being than he was a player…and he was a fabulous player. “There’s a rare breed that can be wonderful golfers but also wonderful people and he was that.